The Fed has taken interest rates to zero. They have clearly started a program of quantitative easing. What exactly does that mean? Are we all now Japanese? Is the Fed pushing on a string, as Japan has done for almost two decades? The quick answer is no, but the quick answer doesn't tell us much. We may not be in for a two-decades-long Japanese malaise, but we will experience a whole new set of circumstances. My friend Niall Ferguson introduced me to a young former hedge fund manager, Jonathan Starr, who in 2009 started a prep school called the Abaarso School of Science and Technology in Somaliland with a sizable personal donation and the investment of his time. When Jonathan first went there, he and the completely volunteer staff of foreigners did not know the local customs, did not speak the language, and were not professional educators. To say their task was challenging is a huge understatement. The local Muslim community looked on them with suspicion, and there were efforts to close them down. But they persevered and have been wildly successful. If you meet Jonathan and his team, you quickly understand why they have prevailed. Jonathan has invested 100% of his time in Abaarso and has had no other job for 6+ years. In 2013 one Abaarso grad became the first student from Somaliland in three decades to earn a scholarship to a US college. Graduates of Abaarso have since gone on to Harvard and MIT, Georgetown and Oberlin, and many other colleges. Thus far this year, in the early-decision period for US colleges, Abaarso students have already received a handful of acceptances, including from Brown, Swarthmore, Brandeis, and TCU. The school is intense, with 60-hour weeks for the teachers and a massively strong academic program. They have driven the cost down to about $1800 per year per student. The school focuses on training the future leaders of Somaliland, stressing community service and the need for students to give back to their countrymen. The school is growing rapidly: there have been 95 graduates from the first three classes. Each class now numbers between 40 and 50 students; and Starr, who is not only the school’s founder but also its headmaster, expects that nearly all of those students will receive scholarships to study abroad. He projects that within 15 years nearly 500 Abaarso graduates will have earned bachelor’s degrees at foreign institutions. In a small country like Somaliland, that will have a major impact. In the first few years Abaarso had trouble getting female students to school, but this year the incoming class is 50% male, 50% female. There are now some 60 students studying abroad. In a region known for its violence, the school is giving hope to young men and women. Some of the stories of the orphans and homeless students who have gone on from Abaarso to Ivy League schools in the US and major universities around the world are both heartbreaking and inspiring. You can visit their website here, where you can easily donate to their cause. I also hope that some of my readers will drop an email to Jonathan Starr at jstarr@abaarsoschool.org. Ask him to send you his PowerPoint presentation and other materials. Some of you could easily think about sponsoring one of their older students in a prep school here in the US. We are talking about kids who are making spectacular contributions to colleges and prep schools when they are just given the chance. Now, let’s look at the world of credit. The Fed’s reversal comes at an interesting (pun intended) time for credit markets. If the financial crisis ripped the fixed-income sector apart, the years of ZIRP served to reassemble it. However, the new version only superficially resembles the old one. A fixed-income market in which the only fixed element is an interest rate fixed at zero is not something that would arise naturally. It exists only because someone twisted nature into a new shape. And as we all know, it’s not nice to fool with Mother Nature. She always takes her revenge. ZIRP distorted the economy and the financial markets in countless ways. Remember when we had a “risk-free rate of return?” We used to regard the 30-day Treasury bill rate as a benchmark. It figured into metrics like the Sharpe ratio. If you could make 5% on your money with no risk, any manager who only delivered 3% would have to polish his résumé. I hear you asking, what is this 5% return you speak of? Believe it or not, Treasury bills really yielded 5% as recently as 2006, right before the Fed began the easing cycle that ended this week. Everyone, myself included, thought that was perfectly normal. Returns in that range or even much higher had been our experience for 50 years, other than a brief stay just below 1% in the early-2000s recession. T-bills had always given us a nicely positive yield. No one imagined any other possibility. That world in which 5% was the minimum return you’d expect from any manager worth his salt is pure fantasy now. We just finished seven years in which achieving returns with a + sign in front of them required taking on risk. We’ve been able to choose our poison. We could take credit risk, inflation risk, equity risk, hedge fund risk, hurricane risk (seriously, you can) – any risk we liked. The one thing we weren’t allowed to have was daily liquidity with returns above zero as a certainty. It was the Age of the Guessing Game. The ways in which the Fed has changed investor behavior are legion. By creating an environment that forced everyone to take risks, Ben Bernanke moved liabilities (i.e., deposits) out of the banking system and into risk assets. This helped the banks rebuild their mortgage-laden balance sheets. Quite naturally, and as a direct consequence, the price of risk assets rose as everyone piled into them. Stocks were only one example. Look at housing, as well as most natural resources. They rose nicely while ZIRP reigned, as did assets all over the emerging-market world, setting up the crash of the past year. Bernanke’s 2013 QE “taper” comment was a big hint that change was coming. It took longer than anyone thought, but now that change is here. As Ambrose points out, the Fed typically needs about 350 basis points of rate cuts to be able to work its “magic” on the economy. Although Fed governors project about 100 basis points of interest-rate hikes in the coming year, the market is seeing only two hikes of 25 basis points apiece. I’ll go with the market. The Federal Reserve economists and board members’ projections assume no recession through 2019. If history has anything to say, they will be wrong. And while my opinion carries nothing like the weight of history, I personally think they will be wrong, too. We have already had the third longest “recovery” (weak as it is) following a recession since World War II. To think we can go without a recession for another full two years, through 2017, strains credibility. We will need to get well into 2018 or 2019 before we see the Fed’s projected funds rate of 3.5%. I will repeat my wager from earlier this week: I think the chances that we’ll see 0% interest rates before we see 2% interest rates are better than 50-50, and I will give odds that we don’t see 3% before we are back to 0%. That means the Fed will not have enough “bullets” in its interest-rate-cut arsenal. If the US goes into recession, a global recession is likely to follow. The world has never seen a full-blown recession with interest rates this close to 0% in both the US and Europe. The stimulus central banks would apply to stave off that recession would be staggering. Whether or not their Hail Mary pass would work is another question. That last-ditch effort would make the previous period of QE look like a stroll in the park. A sideshow to this grand monetary experiment played out on Capitol Hill. Congress, as it often does, observed the horses escaping to the north 40 and decided it should close the barn door. It did this with the Dodd-Frank financial reform law. Like much legislation, Dodd-Frank has given rise to major unintended consequences. For instance, the “Volcker Rule” has sucked liquidity out of the bond markets. Liquidity does not materialize from nowhere; someone has to provide it. That person or institution doesn’t work for free. Yet the Volcker Rule leaves little room for profit, for banks at least. The result, for now at least, is that banks hold a fraction of the bonds in inventory that they used to. You may applaud or decry this outcome, but it is a reality, and it reduces banks’ ability to fill the market-making role they once did. Which means that when there is forced selling in the credit market, like we’ve seen the past month, the banks aren’t there to provide liquidity. Over time, new private institutions will develop to provide that liquidity, at a price. But until that time, volatility will be the rule. This month’s thunderbolt liquidity event struck with the announcement that Third Avenue Focused Credit Fund (TFCVX) would close and liquidate. Recent results had been awful – down 27% this year. Investors withdrew two-thirds of the mutual fund’s assets in the seven months before it closed, leaving it with only $788 million. What happened? Third Avenue focused on the riskiest end of the debt market, mainly companies that had gone bankrupt or were in distress. In other words, it owned bonds with such horrible prospects that even high-yield funds wouldn’t touch them. Believe it or not, this can be a good business. Howard Marks of Oaktree (a huge distressed-debt hedge fund) is positively ebullient when talking about the opportunities in distressed debt today. It’s a different kind of investing. A fund might buy bonds issued by a company that is edging toward bankruptcy. Maybe they pay 30 cents on the dollar but figure they can get out at 50 cents on the dollar after the company restructures. That’s a good deal. Sniffing opportunity out takes a whole different kind of analysis and battalions of sharp-eyed lawyers. You see this kind of investing more often in private hedge funds – and with good reason: those sort of bonds are not very liquid. Mutual funds like Third Avenue have to let investors redeem at net asset value every day. They apparently reached a point where they couldn’t do it. I can only imagine what sort of meetings lead up to a decision like this one. They could have kept the fund going and raised cash by selling off the holdings at fire-sale prices. They decided instead to halt redemptions completely, distribute the cash on hand, and place the remaining bonds in a liquidating trust. Investors will get periodic payments as the trust sells its bond holdings over the next year or two. Some investors are displeased, but this move was the right one. They should be able to “work out” of the remaining positions on better terms than they would have been able to do by selling those positions all at once. This brings up a key point I think many investors forget: liquidity is never free. You pay for it, usually in the form of lower returns. Back when banks actually paid interest, you could have a savings account or a certificate of deposit (CD). What was the difference? Well, the savings account allowed you to take your money out whenever you wanted. The CD kept it locked up for a defined number of months or years. Which one paid higher interest? The CD, of course. The extra return was your reward for giving up liquidity. The interest forgone for owning a savings account instead of a CD was essentially a penalty. You paid it in exchange for the right to demand your cash at any time. The same principles apply to securities. Open-end mutual funds and ETFs have to be prepared to meet redemptions at any time. That forces them to keep some uninvested cash and to buy only liquid securities that they can unload on short notice. Furthermore, if they are forced to sell due to redemption requests, buyers know this and lower their bids. This further reduces any potential profit and, as we saw in the case of Third Avenue, can lead to very large losses. A closed-end fund or a private hedge fund offers less liquidity to investors but greater flexibility to managers. These funds can take advantage of opportunities a public fund can’t. Other things being equal, this usually translates into higher returns over time. I’m quite familiar with one private credit hedge fund whose returns were down almost 30% in 2009; but as it turned out, not one investor lost money. There was a rolling three-year lockup so nobody could withdraw money during the crisis. The fund was back at a high-water mark in a little over two years; and by the time anybody could redeem, the fund had garnered a reasonable profit for the full three-year cycle. Lack of liquidity imposed a huge cost on those who sold their assets in a private sale (which was possible in private markets, at a significant discount to the already reduced NAV). If you are investing for retirement or some other long-term goal, do you really need instant liquidity? Probably not. So why pay for it? The usual answer is “just in case.” That’s a perfectly respectable answer, too. Just realize that you’re paying a lot for a privilege you probably won’t avail yourself of very often. This principle points to an opportunity: your willingness to give up liquidity is an asset that will buy you a shot at significantly higher returns. More than eight years ago I predicted that the private-credit world would explode into equal prominence with private equity within a few decades. I’m clearly on target for that prediction. It may happen a lot sooner. I’ve been a fan of private credit for a long time. Recently, I have once again been exploring the private-credit world. The term encompasses a whole range of investments. The common thread is that they involve non-bank lending. This market is far bigger than I had thought. Much of the growth in private credit is a direct consequence of declining bank lending. Between the financial crisis and new restrictions like Dodd-Frank, banks have had to seriously tighten their lending standards. Moreover, they’ve had to cut back in ways that don’t make sense. I talk to a lot of small-bank executives and directors. They constantly complain that the regulators are forcing them out of profitable markets and making it impossible for them to do business. I can’t help but sympathize, because they are right. But this regulatory restriction is creating a huge opportunity for the creation of private lending. Meanwhile, not only are banks operating illogically, they are centralizing the illogic. The giant Wall Street banks have been snapping up local and regional banks, thereby eliminating the hands-on, personalized approach to lending. Most banks are now highly centralized bureaucracies. That’s great if your need is shaped like their cookie cutter. If it isn’t, the big bank can’t help you. Here is an example I ran into last week on Lending Club. Say you want a $25,000 debt-consolidation loan. Your FICO score is in the “good” range – 660-720 – and you have annual income over $100,000. With Lending Club you can get a five-year loan at 7.89% with a 3% origination fee. That works out to a 9.63% APR, less (and in some cases much less) than most credit cards charge. Modest risk is not the same as no risk, of course, but we’ve already established that risk-free investing pays you little or nothing. It certainly doesn’t pay 5% or more. Peer-to-peer lending through these platforms can earn you a substantially higher income than a corporate bond fund with similar maturity. The difference is liquidity. You can escape the corporate bond fund or ETF with a few mouse clicks any time the markets are open. You can’t do that with P2P. Giving up that liquidity earns you a higher return. P2P is only the surface layer of the private-credit market. It can be a good option for people with relatively small portfolios. Accredited investors and institutions have many more choices. These are hard to find, but the ones I’ve seen are even more compelling than P2P. In many cases, private-credit lenders specialize in a particular industry or market segment. They might be experts in equipment leasing, real estate, education financing, vehicle loans, or countless other niches. This specialization matters, because knowing the niche lets them control risk and offer the most competitive terms. Banks are fully aware of this challenge. They also seem to know how deeply stuck in the mud they are. Their main response so far is to partner with private lenders. The money you deposit in a bank might well end up in some of these private-credit loans. I can see the attraction for JPM. They will keep loans above the $250,000 level in-house and have their own employees do the credit analysis and other work on them. They’ve probably concluded that the small-fry loans aren’t profitable for the bank, but they also don’t want to sacrifice those relationships. Their deal with OnDeck is a compromise toward that end. Such partnerships may be the legacy bank’s best shot at remaining relevant, by the way. They are getting squeezed from both directions. Regulators have made it harder for them to make money in commercial lending to large businesses. 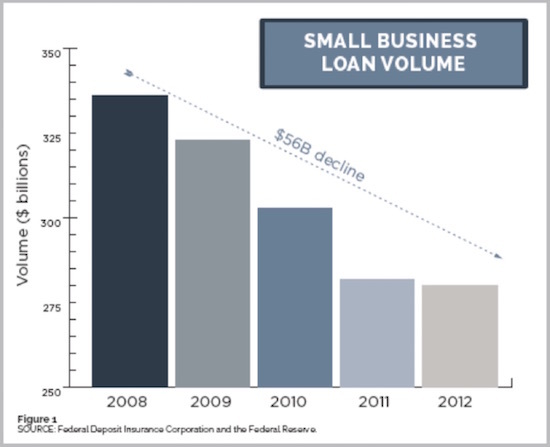 The low-cost private-credit lenders are locking them out of smaller loans. The walls are closing in, so they need to do something. They have a short list of choices. Your list is much longer. People I’ve talked to in the private-credit space tell me it is quite possible, even routine, for investors to earn 300-600 basis points in additional yield simply by giving up the daily liquidity that they may not really need. Private-credit investment vehicles come in many flavors. Some require you to lock up your money for several years. Others have quarterly or annual redemption opportunities. There is a direct relationship between the amount of liquidity you sacrifice and the yield you can earn. Patience is rewarded well. Is that interesting to you? It certainly is to me. This ought to really interest the many Baby Boomers who are approaching retirement with inadequate savings. An extra 3–6% yield can make up for a lot of lost time. Better yet, think of the many underfunded public and private pension plans. Their managers should be all over this opportunity. They should have no problem giving up liquidity, and the extra yield will bring them closer to meeting their obligations. Like all opportunities, this one will become less attractive as it gains popularity. At some point you can have investors wanting to lend more dollars than qualified borrowers need to borrow. That imbalance will push down the yields. Sadly, I am watching that happen in market after market. Once a credit risk becomes well-known and understood, it gets gobbled up to the point that the credit spreads become thin when compared to the risk. Meanwhile, the biggest challenge is finding the opportunities. Securities regulations prevent some of the best ones from advertising publicly. Others have all the cash they can handle and don’t need to advertise. I am planning to include a session or two on private lending at my 2016 Strategic Investing Conference next May. Income planning is a hot topic, and I’ve had many requests to cover it more systematically. To do this, I’d like to ask readers for help. If you are somehow involved in private credit or know of good opportunities, send me an email at business@2000wave.com. Give me as much information as you can. My team will explore these opportunities in the private-credit space and see how they can fit into the conference agenda. We might have a special session limited to accredited investors, but I’ll try to keep it open to everyone if possible. Speaking of my conference, we opened the SIC Registration Page last week. You can save $500 off the walkup rate by registering before January 15. We’ve moved the event to Dallas this year. The dates are May 24-27. Click here for more details. And if you’re interested in being an exhibitor sponsor at the conference, drop me a note. With the holidays at hand, I’m not scheduled to fly until early January, when I will spend five days in Hong Kong, speaking with clients of Merrill Lynch. Later in January, the 24th–27th, I will be the keynote speaker at the big ETF conference (ETF.com), where a few thousand people will gather to talk about portfolio design in the world of ETFs. I’m really looking forward to that. Then I’ll return to the Cayman Islands for a speech in early February. I know I have to get to New York and maybe Washington DC sometime betwixt and between; but for me that is a rather sedate travel schedule – which is good, because I need to be spending most of my time researching and writing my new book. Speaking of that book, I’m doing three to four conference calls a day with the people who volunteered to help me research the various chapters of the book. We’ve done about 15 groups so far this week and will do the remainder (hopefully) this coming week. I am simply amazed at the quality and enthusiasm of the people in what is now The Transformation Project. It has been a huge learning curve for me to try to organize something this complex. If it works, the “secret” will be that I have designed the overall project but am basically expecting the individual participants to self-organize their groups. I just don’t see how one-size-fits-all would work for so many varieties of people and topics. So far, the method in the madness seems to be working. This will expand the research that I’m capable of doing by several orders of magnitude, I think, and most of the people involved have far more experience in their various topics than I do. I will keep you informed as we make progress. My “mental date” for finishing the first draft of the book is the end of April, with May dedicated to rewriting and then handing it off to one of the best old-school editors in the world, Terry Coxon, who will whip it into shape. I’m actually quite energized by the whole process. This will be the last Thoughts from the Frontline of 2015. I really don’t want to be sending a letter out over the Christmas weekend, so the next letter will be my annual predictions letter, arriving over New Year’s weekend. I have traditionally sent my prediction letter out the second week of January, but I’m going to try to do it earlier this year. It’s hard to believe that we will be closing the curtain on another year. Looking back over my life, it seems I am always optimistic about a new year, and this year is no different. More often than not, my optimism is been rewarded. I have had a truly blessed life. As a parting gift, I give you a link to Dallas-based Vocal Majority, the world’s premier barbershop harmony group (150 members), which has won more gold medals than any other such group in the world, offering their amazing version of “Auld Lang Syne.” Here’s raising my cup of kindness to you. I want to thank you from the bottom of my heart for your gift of time and attention. I realize that in a world where we have ever more information coming at us from every direction, your time is the most valuable commodity of all. Dec. 31, 2015, 11:03 p.m.
Reading this discourse on private lending, it seems to be developing into something akin to CDOs which played such a big part in nearly wrecking the US economy, Hopefully, this time around, there will be sufficient oversight and regulation to prevent the same set of circumstances arising in an economic downturn. Dec. 23, 2015, 9:44 p.m.
Jack, Interesting thoughts! I understand your concerns and not real sure how to answer them. Simply, “No one cares” is not accurate!! A large proportion that do care are just not sure the right way to handle things. But, to John’s concern about a recession surfacing again fairly soon, My take is that the American people are starting to get optimistic. Say what you will about our elections and TRUMP. Trump has got the voice of the silent unknown. Accuse Trump of some “PC” problem statement and the polls take him higher. America is sick of the Crap we have been through!! The money will flow into the economy as the election for freedom flows!!! (Just my guess) I don’t think the path will be smooth or vertical. Just assuming we will avoid a recession for many more years. I am also assuming the “Silent Unknown” has been so sick about the process for years, they haven’t voted. BUT, very well may this time!! LNG exports, New Panama Canal opening, World class new chemical plants opening maybe into 2017? New Natural Gas export to Mexico. Mexico starting to contract with foreign companies with oil projects. New Crude oil exports approved! For a couple of weeks (locally, 200 miles north, John) I have seen a few train loads (about 100 engines each) sitting on sidings and that all engines appeared to be marked BNSF. (Yes Engines, not other types of cars.) The engines simply from the road looked old and worn out. But no way for me to actually know!!! Are they upgrading engines for the Panama Canal traffic into Houston and such??? Lot of good things going on!! Besides, Merry Christmas to all! Dec. 20, 2015, 10:40 p.m.
To John, Ed and the rest of the Mauldin Economics Team: Merry Christmas to all and may the New Year see all of you healthy, wealthy and wise. Dec. 20, 2015, 7:31 p.m. Eating my children is a great way to destroy my own future. Banks and governments are eating our children and their future by destroying our financial future. I can let internet banks, internet Facebook, internet retail, destroy our cities the way Wall Mart has destroyed local retailers, gutting our communities, and sending all the money to Wall Street. I can engage in self destruction sending my children to Harvard, never to return to Swaziland or Detroit or ever see their parents again. This technology is destroying our nation with debt run up from $300 Billion in 1964 to $19 Trillion in 2015. Why? For what? No one cares. I am watching the consumption of my nation by Wall Street bankers, brokers, owners, governments, and no one cares. Using debt as money is a weapon of financial mass destruction. Wall Street will end up owning everything using counterfeit debt notes and nobody cares. I don’t understand why slavery with chains is illegal but slavery with debt is legal. Main Street children, families, renters, and employees have been sold into debt slavery and there is nothing we can do about it. I watch the self destruction of my nation and no one cares. I don’t recognize this nation anymore. Bankers who gave us 2008 should be in jail, with their assets sold off at pennies on the dollar. Instead the debt binge continues. Where is the jail time for usury, charging 18% on credit cards in a zero interest rate system, leveraged 10:1, where banks collect 180%? Where is the social justice? The crime of leveraged banking is child abuse. Why aren’t these child abusers being jailed? It’s profits. It’s good business, to eat your children and destroy your own nation. Good luck to us all in this rigged war where Wall Street vampire squid like Goldman Sachs, gets all the profits and Main Street gets the debt. All I can do is watch and wonder why we let these crimes continue. Where is the shame?